Investing Advice And InformationBondsWhat Can We Learn From Jack Bogle, the Conscience of Wall Street? Jack Bogle, the founder and CEO of Vanguard Funds, died a week ago at 90 years of age. He’s most famous for creating the first index fund, promoting low cost investing and keeping Wall Street honest. 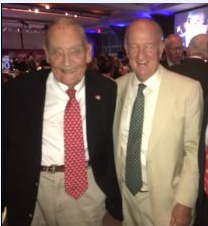 I met Bogle twice; I interviewed him at his Vanguard headquarters in 2010, and then saw him last year at the 100th anniversary of Forbes magazine. “It means that short-run changes in stock prices cannot be predicted. Investment advisory services, earnings predictions and complicated chart patterns are useless… Taken to its logical extreme, it means that a blindfolded monkey throwing darts at a newspaper’s financial pages could select a portfolio that would do just as well as one carefully selected by the experts.” (Malkiel, “A Random Walk Down Wall Street,” p. 24). In 1975, Jack Bogle decided to test this thesis in the real world. He created the Vanguard S&P 500 Index Fund. It gradually has become a super success, to the point where today it is the largest mutual fund in the country, with a combined value of $300 billion. And true to the economists’ thesis, it has outperformed the vast majority of actively managed mutual funds and money managers. The Vanguard Group as a whole manages over $2 trillion today. As founder of the Vanguard Group of funds, Bogle also made his investment company famous for providing low-cost investing. In fact, the annual expense ratio of Vanguard funds is only 20 basis points. The fact that turnover has catapulted so much and the cost of doing business on Wall Street has fallen sharply is arguably something that Vanguard has contributed to spreading. Because of the financial revolution, bid-ask spreads and commissions are at historic lows. Known as the “conscience of Wall Street,” Bogle has never been a fan of speculators and CEOs earning excessive compensation. He was critical of Fidelity funds, one of his competitors, for hyping its returns and encouraging short-term trading. His hero was the long-term investor (Vanguard’s primary customer). If you’re 30, then 30% should be bonds, 70% in stocks. If you’re 80, then 80% should be bonds, 20% in stocks. But otherwise, he was skeptical about adding real estate, gold and other exotic investments to one’s portfolio. “I don’t like the idea of complex investing, other than simple stocks and bonds,” he said. During our interview, I asked Bogle about his lasting legacy. He responded quickly: “Character counts. I think I’ve made the world a little bit better for investors.” Indeed, he has. We’re pleased to announce a number of first-time speakers at this year’s big show. In addition to Kevin “Mr. Wonderful” O’Leary, our keynote speaker, we have confirmed the outspoken Candace Owens, director of communications at Turning Point USA, who will address us on Friday, July 19, on “UnCivil War: Can a Divided America Stand?” with John Fund (National Review) and Grover Norquist (Americans for Tax Reform). George Mason University Professor Don Boudreaux is excited to attend and speak at his first FreedomFest conference. He will be debating Steve Moore, a supporter of President Trump’s economic policies, on “Trump’s Trade War: Good Deal or Bad Deal?” It is not to be missed! Our super “early bird” discount ends Feb. 1! Save $250 off the retail price of $695 — you pay only $445 per person, and $300 for each guest. Go to www.freedomfest.com, or call toll-free 1-855-850-3733, ext. 202. Orlando MoneyShow, Feb. 7-10, Omni Orlando Resort: I will be leading a main-stage panel on “The Best Places to Put Your Money in 2019,” plus a workshop on “Flying Five Strategy: My Favorite Way for Conservative Investors to Beat the Market and Earn High Income.” My wife Jo Ann and I also will be speaking on “Partnership Investing.” Other speakers include Louis Navellier, Jeffrey Saut (Raymond James), Stan “The Annuity Man,” Steve Moore, Brien Lundin, Mark Mobius, Jim Lowell, Kelley Wright and fellow newsletter writers Hilary Kramer and Mike Turner. Tickets are complimentary. Call 1-800-970-4355. And be sure to use code 046878. The Fed drives the stock market, but what drives the economy? The biggest blunder was made by former Fed Chair Janet Yellen, who focused her entire outlook on consumer spending, which she claimed “represents two-thirds of all spending in the economy.” Wrong! The myth that “consumer spending drives the economy” is like a bad penny that keeps showing up, even at the Federal Reserve! Yellen uses gross domestic product (GDP) as her measure of “total spending” in the economy. It is not! She should know better. GDP leaves out all the business-to-business (B2B) transactions in the supply chain, which is larger than GDP itself. Apparently, Yellen is not familiar with the new gross output (GO) statistic that the government now monitors. GO includes all sales in the economy, including the supply chain. Thus, GO is the best measure of total spending in the economy. It turns out that consumption is only about “one third” of GO, while business spending represents over 60% of total spending. Thus, it is business activity, not consumers, that drive the economy. Consumer spending is the effect, not the cause, of prosperity (Say’s law). Good news! Speaking of GO, I’m happy to announce that the Wall Street Journal (Jan. 7 edition) released an update on GO. The article is written by Simon Constable, author of “Guide to 50 Economic Indictors That Really Matter.” I’m quoted in the article, stating that GO represents the “top line” in national income accounting, and GDP the “bottom line.” Read the article here.